In a perfect world, every meeting would be short and to the point, start and end on time and something meaningful would get accomplished. And that’s frustrating for a lot of managers who think they have much better things to do. So, why do we hate meetings? A ResourcefulManager survey of 948 upper-level executives, directors, middle managers and frontline supervisors says nothing gets accomplished in 44.8% of the meetings executives and managers attend. Plus, check out all of our great infographics. 51% say nothing was accomplished in 5 or more meetings they attended. And more than 53% of that group said nothing was accomplished in 7 or more. Only 8.9% say something was accomplished in all 10. Of course, those same managers think they do a great job when they are running the meetings. 90.4% say the ones they are in charge of are efficiently run. BUT, only 65.2% of the ones they attend that are run by others are efficiently run. 38.7% didn’t start on time. 40.5% didn’t end on time. What was the average number of people attending a meeting? 7 people was the average number in attendance. How long is the typical meeting that executives and managers attend? 61.1% of all meetings last at least an hour or longer. Now, Here’s The Good News . . .
61.6% attend the right number. 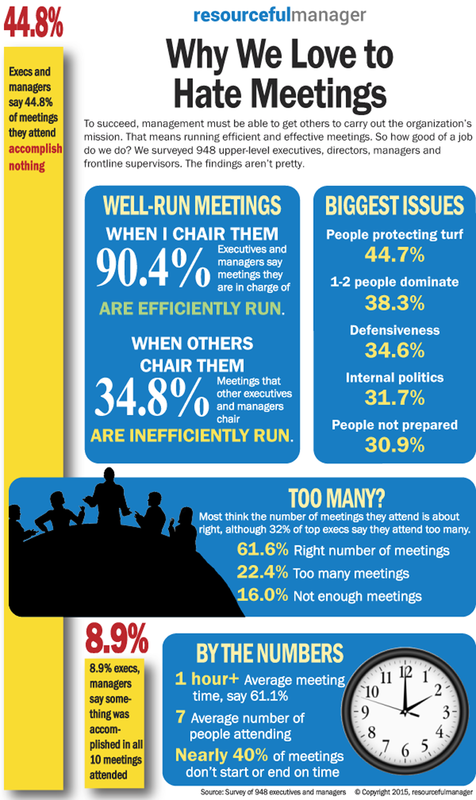 22.4% attend too many (however, 32.3% of upper-level executives say they attend too many meetings). 16.0% say they don’t attend enough of them. 2) Begin the meeting on time – of course if no one is present when the meeting is scheduled to start, there is not much you can do. However, if there is one other person present, start the meeting. Many people assume that you will start late or will wait on them to get there. Starting on time will help guide those individuals to be on time. 3) Don’t over estimate what you can get done in one meeting. Plan your agenda so that it takes up about 75% of the allotted time. That way if a particular agenda item takes longer than you anticipated you still have a chance to end the meeting on time. And if you only use 75% of the meeting time, no one will be angry with you, trust me. Nice to know the survey results, but even better to know Cassandra’s comments on what to do about it. Thanks Ms. Hargrove. Yeah, Gayle, I agree. Cassandra made some great points. Do you have any tips to share with us? Cassandra… Those are great points. Preparing ahead of time is really important…. And I find many folks have too many things on their agendas… and it’s not possible to really deal with that many…..